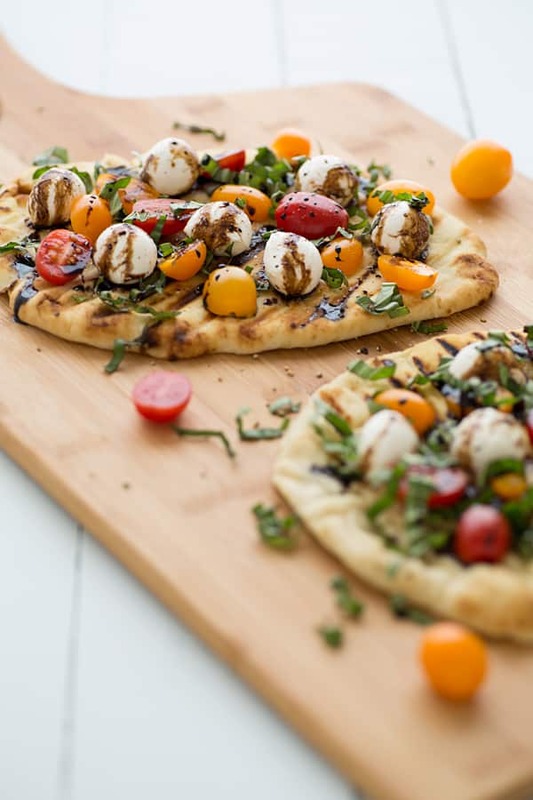 Vegetarian Grilled Caprese Naan Pizza Recipe - Oh My Veggies! When we were in Atlanta last week, we ate lunch at a restaurant a few blocks from our hotel called Naan Stop. I got a naanwich filled with chola (no, not that kind of chola) and a sweet apple-tamarind curry, which was messy, but delicious. Why are there not more naan restaurants?! There really should be. I’m kind of convinced that naan is the new pita. 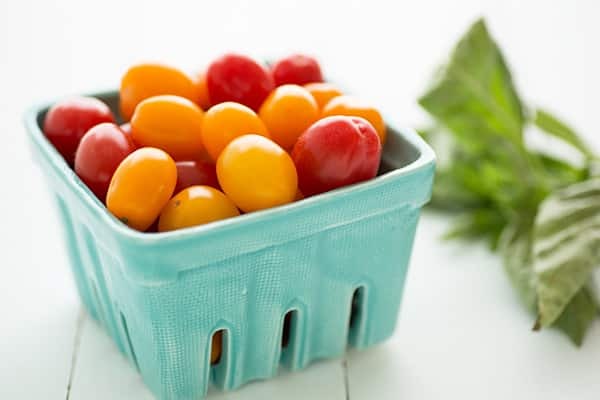 You can use them both in the same ways–tear them into pieces and use them for dipping, make sandwiches with them, and use them instead of a traditional pizza crust. But what makes naan better than pitas is that now you can buy tasty naan in your local grocery store. While you can buy pitas too, so often they’re dry and tasteless. I am not a big fan of store-bought pitas, but I’m pretty crazy about naan. I’ve used naan as a pizza crust before, but the difference in this naan pizza recipe is that this time, I grilled it first. You can do this on an outdoor grill if you have one, but I just used a cast iron grill pan–much easier! Grill both sides of the naan until it’s warmed and has nice grill marks on it, then top it with grape tomatoes, mozzarella, basil, and drizzle the whole thing with a balsamic reduction. An easy summer pizza made with a grilled naan crust, fresh mozzarella, and grape tomatoes. Although I used a grill pan, you can also grill your naan on an outdoor grill. Heat balsamic vinegar in a small saucepan over medium heat. Simmer until syrupy and reduced to about a tablespoon, 8-10 minutes. Heat a grill pan over medium-high heat. Spray both sides of one naan with olive oil and place it in the pan, pressing down on the top of it with a spatula to sear. Cook on each side until just beginning to char, about 2-3 minutes. Repeat with second naan. 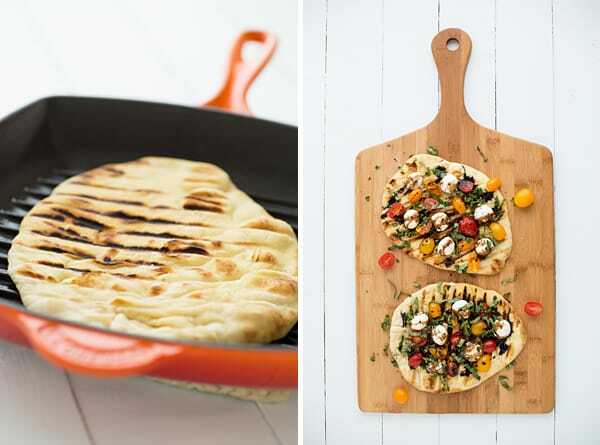 Top each naan with tomatoes, cheese, and basil. Season with salt and pepper and drizzle with balsamic reduction. Cut into wedges and serve. If you can’t find ciliegine at your grocery store, you can buy a bigger size and uses slices of it on the pizza instead. Thank you for all suggestions.